Along the path to the right, after a Rocket Imp, is a bomb, take this back to the start and go left up to some barbed wire which you'll want to destroy. Fire the cannon to destroy the building in the centre of a large battlefield, it will reveal something useful. Now go back and grab another of those bombs, this time head north and destroy the barbed wire there. Watch out for the Gun Snout, once you've killed it go up to the left and grab the Story Scroll. Now go south through the exit directly to the left of where you just came in. Watch out for the pits with mines in and go grab the Legendary Treasure that you revealed after firing the cannon earlier, it's right in the middle. If you continue south from there you'll find a Treasure Chest. Backtrack to where you fought the Gun Snout and go through the monster gate to the north. A fairly long path now, once you reach a pair of Trollverines go left and grab a key from the floor. Continue onwards north through a small brick fence, on the other side to the right is another larger brick wall you can smash through and find a Soul Gem, Drill Sergeant's "Arkeyan Armor". Open the locked gate and head left past a Blaster Troll and a Rocket Imp. There's a few more enemies up at the end next to a monster gate that'll open once they're dead. Destroy the Gun Snout and walk up the slope behind it, keep moving though as the building there will shoot at you. Approach the wooden door and step into the teleporter inside. Fire the cannon and then teleport back. Go south at the point where you encounter a bunch of Blaster Trolls, pass by the cannon and enter the Undead gate. Teasingly you can see the Present straight away, but you can't get to it yet. Walk around the back and you'll see a purple icon on the floor for a bomb, no bombs in sight though. Use the teleport on the left. Walk up the slope on the left and avoid standing on the small stone button, this will raise up a set of four blocks to your left which you don't want to do right now. Drop down into the area next to them and bounce up out again north. Drop off next to a bomb icon and then smash through a brick wall at the top of the slope here. Behind there you'll find a bunch of MEGA BOMBs. Roll it down and to the left into the barbed wire. Stand on the switch behind there and then go and grap another bomb. Take this through the blocks that just lowered and put it onto the set of four to the south. Walk (without the bomb) back through the lowered blocks and bounce up using the pad to the right. Go south and press the button for those four blocks to raise up the MEGA BOMB. This is where it gets tricky, you'll need to push the bomb along the raised section north to a bomb icon there, you might have some trouble keeping it from falling down the ramp, you can push it back up if it does but it might take some doing. Behind that barbed wire is another Treasure Chest. Reset the square of blocks to its lower position and then go take another bomb. Bring it back up on the blocks and then just push it down the ramp. Position it on top of the button at the bottom of the thin ramp so that it keeps open the gate to the right. Step onto the button behind there and the blocks next to the thin ramp will raise. Now just push that bomb up along those blocks and into the blockade next to the Present with a Combat Hat inside. There's another building to destroy ahead so fire the cannon here, then go north past the junction you came in on and kill a Gun Snout. Grab the key to the left inside the remains of that building you just destroyed, and the second key north of a piece of barbed wire with a bomb icon. Before you can go through there you'll going to have to go a little further, so open up that locked gate to reach the command post where Rizzo is waiting. Now that MEGA BOMB is what you need to destroy the barbed wire, take it back through and blow it up. Drobot's "Afterburners" Soul Gem is your reward. Head back to the Mega Bomb again. Roll the bomb north and push it into one of the blockades marked with a bomb icon. Step up the slope in-between the two blockades and grab the bomb, use the bounce pad and then throw the bomb at the turret in the top left corner. This will reveal another bounce pad, use it to get up over the wall on the left. Go up the ramp (watch out for mines on the ground) and bounce across the gap to the last Treasure Chest. Now to deal with the tank, drop back down and, just like the smaller ones, attack the barrel at the back. You can also use the bombs to help if you like, it'd certainly help with the turrets in the bottom right corner. Once it's destroyed you can pick up the Eternal Tech Source. If you go down to the beach and approach the spooky door you'll meet T-Bone. He'll ask you to find his body parts, they're all over the beach but searching is made incredibly easy by the massive dotted lines leading to each part. The last part will require you to push a few turtles out of the way, but once you're done it's time to go to the Crawling Catacombs. My first comment! The treasure chest in the undead gate is the hardest treasure chest to get in the game. the tank is so easy. THE MEGA BOMB WON'T GO UP WITH THE BLOCKS!!!!! 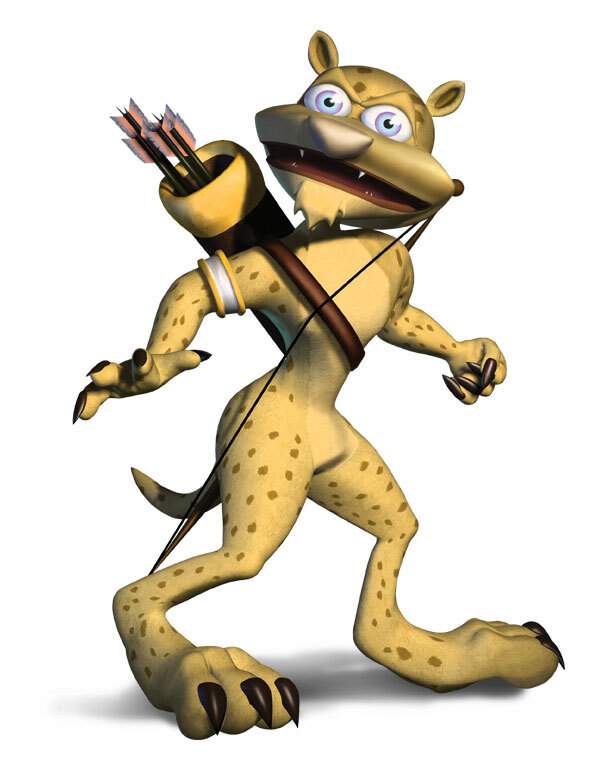 I hate the Kaos level, those mad spikes always kill all my Skylanders! I LUV THIS GAME I AM GETTIN IT SOON CANT WAIT WOO-HOO FIRST COMMENT LOL! GO CAPS!